Sweeteners (maltitol, sucralose), palm oil, whey protein isolate [milk], maize flour, hazelnuts (8.3%), fat-reduced cocoa powder (5.5%), starch, bulking agent (polydextrose), hazelnut paste (2%), almond paste, skimmed milk powder, cocoa butter, inulin, emulsifier (soy lecithin), butterfat [milk], salt, flavouring, raising agent (ammonium carbonate),thickener (guar gum), acidity regulator (ascorbic acid). 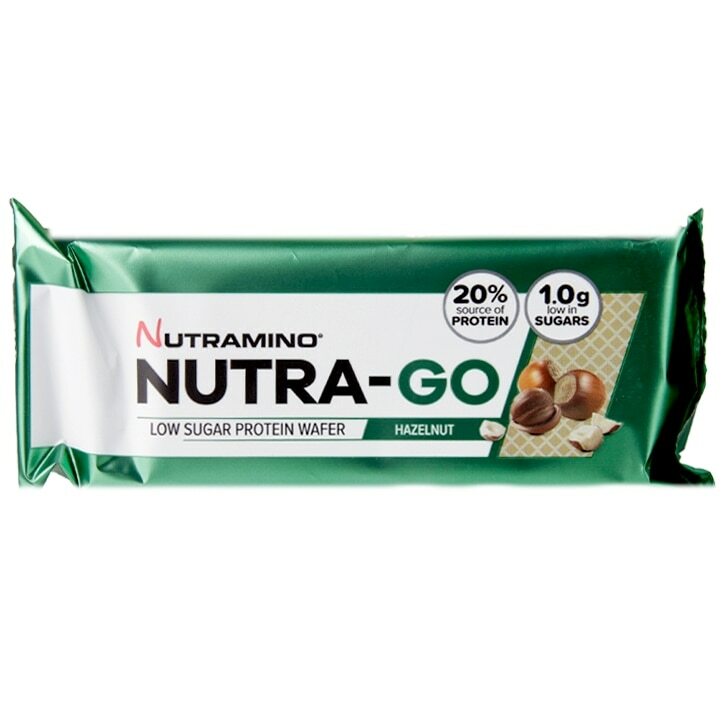 Nutramino Nutra-Go Protein Wafer Hazelnut is rated 4.9 out of 5 by 8. Rated 5 out of 5 by Tinky05 from So scummy! I loved these chocolate wafers. I like that they’re are individually wrapped so you can half half now and half later. These taste like the chocolate wafer biscuits I used to eat when I was young. Very yummy, I would definitely recommend.